101219 + All up and to church and Sunday school. Home for a fast lunch. 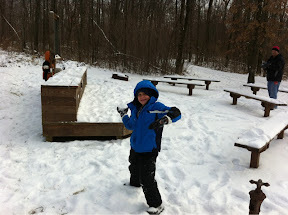 Then DJ&I got bundled up and headed to Blendon Woods Metro-park. 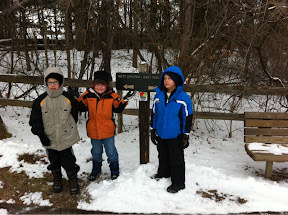 We met up with a couple other Tigers from J's Den and took a nice winter hike. We had the Ranger give us a presentation, saw some cool animals, sang some Christmas songs, did some tree rubbings and had an awesome snowball fight! Home and loaded up the camel. D&J stayed outside playing in the snow until it was time for rehearsal. G&I stayed home, watched some TV and played on the Wii. All back together for dinner. They told the story of Jack falling asleep at the play practice and rolling down the steps. He was ok and it made the kids laugh. I guess all of today's outdoor fun wore the little guy out.